Echofest, Member/Member Tournament are you ALL IN! is about to begin without you if you have not signed up. September 13-14 are the two action packed days of golf. The staff is always geeked up and ready for this event. We want the course to shine and will do everything we can to provide you with a great event. Get a partner and get signed up soon. If you don't have a partner, contact Barrett and pro shop staff and they can try to find you a partner. Its less than 16 days away, sign up now!!!!!!!!!!!!!!!!!!!!!!!!!!!!!!!!!!!!!!!!!!!!!!!!!!!!!!!!!!!!!!!!!!!!!!!!!!!!!!!!!! Right now our turf is holding up well under the current heat wave we are experiencing. It is getting rather humid overnight but the dew pts and humidity are lower during the afternoon. This allows the turf to stay a little more more firm. ET rates which basically measure the amount water that is lost through evaporation through the soil and the plant are high right now. These number range from .12" to nearly .16" over the last couple of weeks. These type of loses do require us to place moisture on the greens at night with our irrigation system and we do supplement the greens during the day with additional hand watering as needed. In late July and early August, we were able to topdress our greens and brush them on at least 3 occasions but have to since stop this because of the high temperatures. Once the heat subsides, we will definitely continue this program. We will also do some light grooming/verticutting to help stand up the turf but will not do this until we are confident the most severe stress has passed. We have not been overly aggressive with our greens in an effort to allow them to get through the stressful period. Being too aggresive during this heat could push our green systems over the edge and give us a miserable fall golfing season and no one wants to see this happen, especially me!! We did lower our height back to our normal position but I'm confident we will not experience any issues. The solid roller program gives our turf a little more added protection until we can begin to groom the surfaces again. If we begin to see an issue, we can always skip a day mowing and roll a particular problem green if that occurs. 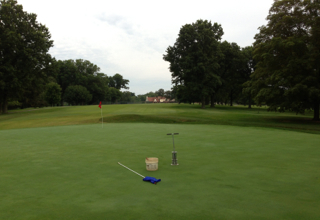 We are out inspecting greens in the morning, mid-day and end of the day monitoring conditions. As the weather improves, so will the programs that will help improve ball roll. Later summer, fall golf is my favorite time of the year. Drier conditions and lower humidity have a tendency to provide for the potential to some pretty special ball roll out! We are breaking out all of the tools to help us through this period. We are using our polarized glasses which help to identify weakened or dry spot areas early before they actually show up to the naked eye. Healthy green plants look fine but stressed plants show up brighter red with these glasses. I usually have to take them off once I leave the green because it enhances every dry ring under trees and or stressed areas on the course. For a moment you might think you are on Mars! We are taking moisture readings using our Spectrum Soil Moisture Meter to assist us in determining the % of moisture to a 3" depth that our greens are holding. I've not had to use the monitor much this season because of the frequent rains but the last few weeks have required the use of this tool. One of the things I have noticed recently is that our moisture levels are averaging 6-8% lower in general than they were last year before the green shows serious stress. Last year, a green was becoming stressed at right under 30%. This season, I'm seeing greens averaging 23-25% and the overall green is looking great with some spots being slightly stressed from levels in the teens and below. I know our root systems are pretty good for this time of year but I'm trying to come up with some additional answers of why the lower stress %. I did recalibrate my meter to make sure everything was correct. I believe some of the answers are from the new products we have placed in the rotation this season but we also cannot completely rule out mother nature. This is a reading from #2 green from the Field Scout Moisture Meter. The top row on the far right is the moisture % for that spot. 13.5% The bottom row on the right is the average for the green after taking 16 readings, 22.4%. Last season, if I would have had an average reading at 22%, I would have had a five alarm fire occurring on the green and I would have had a panic attack. I did get one additional needle tine/venting completed to the greens this summer. Don't necessarily believe that could be it but it is still helpful. I have started to use a fertilization/poa reduction program on 10 greens this spring after using it on 4 last season. Just before the Member/Guest in June I started using the program on all greens and the results have been pretty impressive. This is the product from GenNext Complete which incorporates an A&B product that provides almost a 1/4# of Nitrogen to our green system each month as well as other macro nutrients, enzymes and other proprietary products. I've also started using a compost tea called Bio Nectar on a regular basis which should be improving my microbial populations providing a better soil environment for turf to grow. I'm using a wetting agent along with a penetrent combo monthly which assists with water management. Lastly, I'm using Turf Screen which has been identified to reduce UV ray damage to turf and has been shown to reduce wilt and overall turf stress. I am seeing some of the turf going under stress but it seems to be happening at a slower and lesser degree than I've experienced in the past. I don't necessarily think there is a silver bullet in our program. The GenNext product could be that but I want to see some reduction in poa annua this fall and next spring before I give it my complete and undying love and support! Each product as well as the other products we utilize help to provide the current conditions we experience. Also have to keep in mind that every greens unit is inspected for sharpness and height of cut before it goes out each day. This is another factor in our plant health care program that we should not forget. In the end, five years of thankfully mostly good, sometimes average and I don't like to think about it but it has happened not so good managing of these old greens does count for something as well. 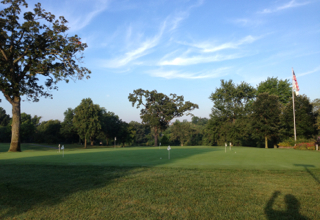 When I arrived at Glen Echo in August of 2008, my first impression was that shade from trees was creating serious issues to the health of the greens. Over the years, I had read articles and seen presentations of superintendents doing shade studies of trees near greens. I decided my second week here to do a study of our trees to determine if specific trees I had identified were a true problem. After going through the process of taking pictures of each green on the course at approximately 7:30, 9:30, 11:30, 1:30 and 5, some interesting information came to light. Some trees were definite problem but others were not creating shade issues for greens. It's time to do another study since 5 years of growth has occurred and done trees have been removed which helps improve green and other turf health. I will also do a study in the winter and spring next season so we get views from different angles of the sun's path across the sky. What we are trying to determine from the study is the length of sunlight each green receives. Early morning sunlight is the best sunlight for plant health. It initiates the photosynthetic process which helps to produce energy for the plant and allows to reduce heat that can build up in the plant. Late afternoon shade is fine for greens as long as it has had a full day of sun. A minimum of 8-10 hours of sun is ideal for greens. Most active diseases like moisture so the longer the leaf blade is wet, the better opportunity it has to multiply and expand. PG view at 7:30 a.m as a part of the shade study that I am completing today. A perfect example of a trench made last fall from the bunker project actually created a much improved turf situation by root pruning the trees. When managing a property that is full of trees, one of the options to improve turf is to prune or shear the roots down to a depth of 12" or so depending up on the piece of equipment you might have. Trees require at least 4 times much water as turf and when the turf is under large canopied trees, the trees will win. We do not own anything that can accomplish this work but will begin to investigate potential equipment that we should consider buying and or renting for future use. I will discuss this with green committee in the future and will post additional blogs regarding this subject. This is not a one time process. Once you start the work, it should be done every 5 years or so or when the turf begins to thin. It is not normally detrimental to the trees. You usually have to stay out a few feet from the base to insure that the equipment can get through the root system and of course you want to in most cases protect the tree. Drought stressed turf to the left of the picture and healthy, vibrant turf to the right side of the picture. The out fall pipe which was trenched last fall during the bunker project assisted in creating this battle between thin and thick turf. This is to the left of 6 tee water station. The completed right side of #3 red tee with its new sod. Much improved for the horrible turf/weeds that we were once their. 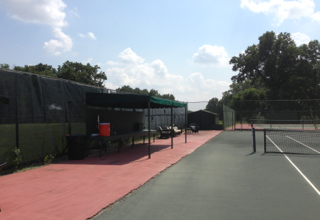 Sorry for the delay but we did just put up the new canvas awning cover at the tennis couts the other day. I've got a video update of the bermuda eradication spray that was completed 9 days ago. As explained in the past, this is a slow process. The bermuda gets knocked back, in most cases it will begin to regrow. The 2nd application in late September is the one that sets up for a potential kill over the winter. We then have to follow up with a spray right at green up in April. In some cases, it takes out the bermuda and we have to sod. In other cases, there is enough zoysia there that will begin to fill in. Below is a video I made this morning regarding this program. For newer members who've not seen the program when we started it in 2010/11, the links below will take you to previous postings. The right side of the 3rd red tee was a hodge podge of cool season grass and weeds. It was stripped off yesterday and new zoysia sod was laid today. Should match up much better with the rest of the tee. Jeff and Randy sodding the right side of 3 red tee. A video regarding the cross cutting of fairways. This was our normal way of cutting a few years ago but as resources began to tighten and we looked at the environmental impact on this style of cutting, it was a no brainer to go back to the old style up and back cut or pro-cut. A number of top clubs have been using this style including Oak Hill during the most recent PGA Championship. My 5th year anniversary, on with the next 5 years! Today marks the 5 year anniversary of my arrival at Glen Echo CC. My how time flies when you are having fun! Our membership has been very supportive with your hard earned money and your expression of appreciation for the work we've accomplished which is sometimes not very willingly given in our line of work. You have welcomed my family(Beth and Lady) to the club for events and activities which I appreciate. Being the wife of a golf course superintendent is not easy with the amount of commitment that it takes keeping the course in great condition. Early mornings, late evenings and multiple weeks in row without days off can strain one's patience but she has given me a great deal of support through it all! The work that is accomplished on a daily basis is done so by a dedicated group of men and women who work 6, 7, sometimes 12 to 13 days in a row to provide the great conditions that you and your guests see on a regular basis at our great club. Without their efforts, I'm a man on a island without a boat or a paddle. Thanks to two very talented and dedicated managers who give great effort to this club and have been supportive of my work, Rob and Mary. Also, cannot forget the remaining group of clubhouse and pro shop staff's that help in providing service to you at this special place called Glen Echo! There is a great deal we have accomplished over the years I've been here. Rebuilt tees, bunkers and improved overall conditions while reducing expenses. I've been placed in an important role of responsibility in sustaining this beautiful property both environmentally and on the business side as the club industry and golf in general has flattened in its ability to grow. We still have a great deal to accomplish over the next few years. I have a laundry list of projects which are needed to help improve the infrastructure of our property and will leave the property in a better place then when I arrived for the next man/woman. Lake expansion/dredging, tee construction, electrical supply for fans, fans for greens that are tucked in the corners of the property, and greens drainage are just a few of projects. Cart path/roadway replacement will be necessary in time as will equipment replacement which will need to start occurring over the next few seasons. It is pretty easy to work long hours when you love what you do and are provided the support and shown the appreciation that our membership has over the last 5 years. Our course continues to improve and I look forward to the next 5 years with the same energy and enthusiasm as when I arrived back in 2008! The golf course and Field Bar will be open this coming Monday for a special opening. Great rate for guests on this day is $ 30 including cart. Tee times will be available between 8-4 p.m. and the bar will be open in the afternoon for cocktails only. Come out and enjoy the club on a Monday opening. I believe I've ordered better than normal weather for that day. With the growth of the Bermuda grass in the rough and its aggressive nature , we have lowered the rough mower height a 1/4 inch to assist you in locating balls in the rough and advancing it out of the rough on your next shot. By Friday evening, a majority of the rough will have been cut once at the new height. Yesterday, we used our rough aerator to pull a 2-3 inch deep core from around our warms season green surrounds. This includes most of #1, 2, back of 3-6, right of 14, and 16. We used a drag mat to break up the cores and mowed the area to clean up the disturbed turf. This will be the same unit that you will see working this coming fall on our roughs helping to aerate them and improve their growing ability. With progress comes some pain from time to time. The color of the turf is a brilliant green all over the property which is a little unusual for this time of the year. I've just spent the past two days spraying some of the fairways with our bermuda eradication treatment. The pretty green will fade in areas for a few weeks so we can begin the process over to remove the bermuda. The plan is that the spray injures the bermuda if not kills it and the zoysia will then grown back up through and over the bermuda. This is a slow process and will take a couple of years. In areas of severe damage, we have gone in with zoysia sod and replaced these sections. I've not sprayed our fairways to remove bermuda since the spring of 2011. We were making nice progress for a couple years on holes 4, 7, 8, and 13 with spot spraying. These four holes were are least contaminated holes. High temperatures and drought conditions with very stressed zoysia turf last summer prevented applications last year. In the last day or so, I've spot sprayed almost 5 acres of material on holes 2, 3, 4, 7, 8, 13, and 17. I've also sprayed approaches on #1, 2, 6, 13, 17 and 18. Over the next 7-10 days these patches will be evident from a yellow/reddening of the turf. The zoysia will turn slightly off color but will rebound over the next few weeks. The bermuda will continue to turn off color and its growth rate will be suppressed severely. I plan to do a second application after the Echofest Member/Member Tournament which will set up the bermuda for some severe stress going into the fall and hopefully a death experience over the winter. I tried not to spray areas that would require sodding zoysia but there is not guarantee of anything when you spray these materials. The link below will take you back to past posts which explains the program in great detail. As the zoysia/bermuda begins to show the effects of the material, I will make addtional posts with either pictures and or video to explain what is taking place with our turf. A second set of discs have now been installed on the cart paths adjacent to the fairway discs which were installed earlier in the summer. This will make it easier for you to locate the teeing ground in the fairway with your children while playing their course . Blue is for level 1(short course) and Gold is for level 2(long course). A couple of seasons ago, we seeded our greens nursery near the 18th tee and the collar nursery near the 16th tee. 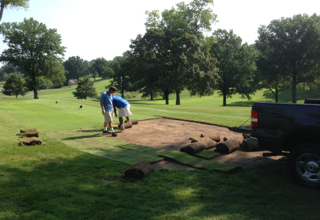 We were able to utilize some of the sod off of the collar nursery but the greens nursery has been a disappointment. We attempted to use the sand that was already in place but we have found out that it is just too coarse to make a tightly knitted turf which can survive transplanting out on the course. Even though the collar nursery was a little better, the sand in its make up was not able to hold enough moisture and ultimately succumbed to last seasons severe heat. With the bunker construction last fall, we were not able to get the area worked up and reseeded. Time to get our emergency turf back in service. I just sprayed non-selective herbicide(Generic RoundUp) and some selective products for broad leaf plants and bermuda grass. You will notice the area turning off color over the next 7-10 days as the plants begin to die. I might make one more application before we strip off the dead material, add some finer sand and organic/inorganic materials to the mix to improve moisture retention. The area will be seeded in September and we should be able to begin mowing it in early October. It takes at least a full year for the material to be strong enough to be used for transplanting. We hope we never need these nurseries but it is almost impossible not to lose a part of a collar every season, have a plug scalped from changing holes or heaven forbid a hydraulic leak which will require turf replacement. Green nursery looking from 18 tee with #2 tee in the background by the trees.. Weather gave us a little setback today on our venting of the greens, brushing and mowing. A lack of sun and wind this morning delayed us in dragging in the sand so we could brush and then mow the greens. When the mowing started, we planned to needle tine/vent our greens. Lightning and a light rain interrupted our work after lunch but a nice late afternoon/evening clearing allowed us to get a little further along with our work. We were only able to get the PG, 1-4 needle tined. We will begin first thing in the morning and do what we can before play requires us to move from the course. I was able to get the PG, 1-13 brushed and mowed before dew began to fall. has been posted on the side panel of the blog. We are less than 35 days from the biggest Member/Member event of the season. Two rounds of golf, great food and hospitality including lobster dinner Friday evening, beverages, prizes, and horse race shootout to determine overall champion. Auctioning of teams takes place Friday evening. Very reasonable cost and pro shop can team you up if you do not have a partner. With the current conditions of the course, it should be a spectacular event with some interesting green speeds to help with your enjoyment. Had to share this great divot pattern with the membership from what I saw on the long range this morning. Quick snapshot of Tapas menu available on Wednesday's along with the pub menu. (Editors Note, alignment is a little strange with this post. Cutting and pasting from NOAA's website creates this issue). was the first day over 90. Enjoy this report below. The Tapas menu is back on Wednesday's. 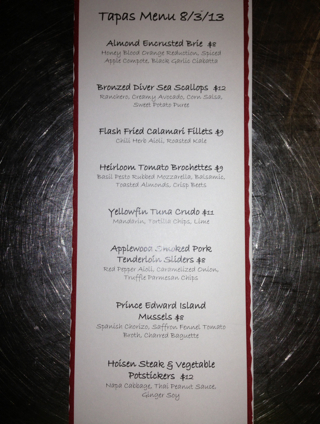 Come check out what Chef Terry and Jeff have created for you!! We core aerated the long range tee, applied some heavy sand topdressing, removed the cores, brushed and mowed the tee. We also solid tined all of our tees on Monday/Tuesday to a depth of 5" with a 10% kick put in our Verti-drain 7316 which helps to fracture the soil allowing for improved rooting and moisture movement through the turf profile. We also applied a heavy topdressing of sand on the tees to smooth the tee surfaces, improve tees entering the ground, improve water movement through the surface and provide a rooting medium in the aeration holes. Below is a video of the long range tee work. A short video explaining the venting/solid tining of our collars/approaches we did on Monday. Collars are the most drought prone turf on our course due to the fact that the greens which are right next to the collar receive small amounts of water so that the greens roll well and are healthy. The collars require more water and one way in helping with this issue is extra venting/solid tining of these surfaces. This will improve root development and will allow moisture to penetrate these areas with less restriction. Our hand watering efforts focus on these areas because they require more water than our overheads can apply without negatively effecting the greens. With the cooler weather of the last couple of weeks and extended forecasts looking a little milder than usual, we are mowing as of Friday, Aug 2nd back at our normal height of cut on greens.